Reserve your place on this October Running Holiday. When It’s cooling down in other parts of the world the sun is still shining in the Algarve, Portugal. This running training camp is your chance to dedicate a week to training while also having fun and exploring this great location. This was my 3rd Embrace holiday and it was as great as the previous 2! The accommodation and food were great, and the coaching and runs were fantastic! Great weather for a week of training and fun. As a first timer to a running training camp I had no idea what to expect, but this trip exceeded all my expectations. Sessions were ideal for any ability and really made a difference to my fitness. Food was great, everyone was really friendly and the weather was perfect. Will hopefully be back for more! Wow! Had the most amazing week in Portugal with Embrace Sports. It was a challenging but equally rewarding week. We were exposed to a variety of terrains and the scenery was just stunning. The food was amazing and nutritious ensuring we were ready for the next session. Met some lovely people and made great friends. Hope to be back again. This was my first running holiday and I loved every part of it. A fantastic trip, I ran further than I thought possible in a week whilst still feeling I was on holiday with great friends. Motivated and much wiser on training. I want to go again. This must be my 10th trip with you guys now and it was quite possibly the best yet. As always great sessions, food and company in a brilliant location. Every time I come along I push myself harder than I do at home and come back far more motivated. It’s been great watching Embrace go from strength to strength and long may it continue. What you offer is the perfect mix of training and down time, with plenty of socialising mixed in. I always leave feeling tired, full up but very happy and usually ready to knock out a PB. This is my 3rd Embrace running holiday and I am already planning my 4th. Everything about the holiday is fantastic – the food, accomodation, running locations, coaches, and other runners! If you are even thinking about signing up I would encourage you to stop thinking about it and just book in! You won’t regret it! First time on this type of holiday, really enjoyed it will be back. Great location, lots of encouragement, great food. This was my second Embrace holiday, and again it didn’t disappoint. The location was stunning, which meant amazing runs along the beautiful coastline and through woodlands. The Embrace team are very professional, run very good holidays and are amazing chefs 🙂 Already booked up my next holiday for next year! This was my first Embrace holiday, and it won’t be my last. I was worried i’d be the slowest person there, but there were plenty of others about my pace, and I never felt out of my depth. I pushed myself harder than ever before – especially on those hills – but that’s what its all about! Fingers crossed it pays off in my next race. This was my third visit. Had a great time on each occasion. Made new friends , did loads of running. Made very welcome as always. Amazing food, superb location. Returning for my fourth (?) trip to Embrace in Lagos, this week was designed to set me up for the Birmingham Half Marathon the week after returning home and did the trick perfectly. Each day is a total contrast to the previous one, so you’re always switched on and raring to go. And smiling with it. The track day is about as different from my normal running as you can get. I’m rubbish at 800m but pretty decent at 200m. Who knew! Highlights; Killer Pool Champ. Lowlight; falling twice, cracking a rib, but getting up and getting on with it. That’s what Embrace does to you. Makes you better, stronger, happier and a champion. Here’s to the next trip. I was back for a 4th year in a row. I love this holiday. Everything is taken care of. Quality food, top location, lovely people and good coaching. I always come away with a few new friends. Plus there’s the bonus of a blast of autumn sun! All you need to do is run and have a good time. My first Embrace trip and I absolutely loved every minute of it! Coaches were great, food was fantastic and a brilliant group of people. It was a bit daunting going alone and not being a member of a running club at home but there was no need to have been as everyone was so friendly and welcoming. Great variety of runs, some lovely clifftop locations, and my first time on a track – which I loved! 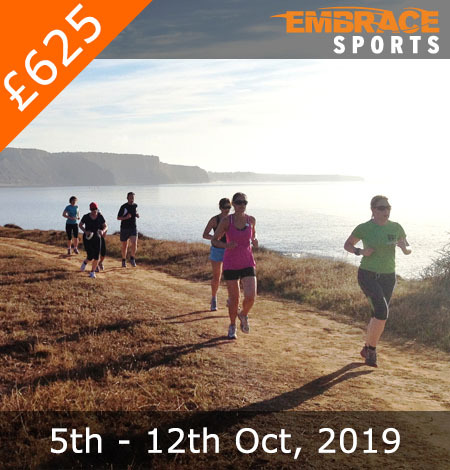 If you love running, regardless of standard, and like the idea of some October sunshine with a great group of people (plus fantastic food) then don’t hesitate to sign on to one of Embrace’s trips!! A brilliant holiday with a good mix of relaxation and hard work. I will definitely be aiming to go again next year! Another amazing camp, I’m just a “little” addicted to Embrace. The location is amazing, apartments are superb and the meals are fantastic. Oh yes, the running. There is a varied mixture of road, track and trail and also speed/ distance. The latter two are based on the individual and no one is made to feel not good enough. The coaches will support you in what you want to achieve in the week whether that’s final prep for a marathon or as part of the rehabilitation from injury. This was my second Embrace trip to Portugal and did not disappoint. I loved the variety of runs available, woodland, hills, track, beautiful coastal runs, beach recovery runs etc. Covered 50 miles during the week, more than I ever would have thought possible for me. I thoroughly enjoyed meeting up with old friends and making new ones and the food and accommodation are first class enabling me to refuel ahead of the next session. Active recovery sessions relaxing by the lovely pool only aided my enjoyment of this Camp. I hope to be back once again. I am a little bit addicted!! 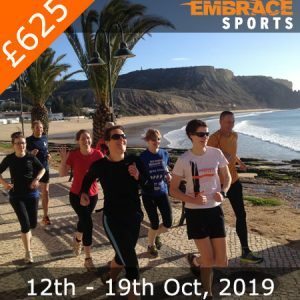 I had an absolutely fantastic time at the Embrace running camp in Lagos, Portugal in early October 2018. This was my 4th Embrace holiday & my 2nd in Portugal & as before had a great time. The location was stunning & the accommodation was really clean. The runs were enjoyable with beautiful scenery. It was a lovely group of friendly people. The coaches were knowledgeable, friendly & served up delicious food. A great way to spend a week in a lovely location with like-minded positive people. Well done and many thanks to The Embrace Team. 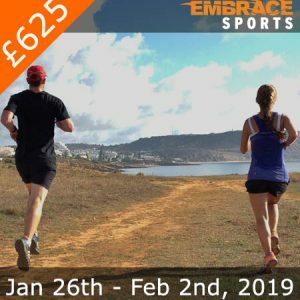 My first visit to Embrace and I had a great week running in Portugal.The location is stunning , the weeks activities well structured and the team supportive . I met some lovely people , shared memorable times and left feeling a great sense of achievement. Thanks guys. This was my first running holiday and I had a brilliant time. I have already recommended it to others in my Running Club. Great fun! I know people think you are mad when you say you are going on a running holiday but this is much more. You’re with a group of like minded people, some fast some not so fast; what is important is the shared love of our sport. Aided by the Embrace team you become a member of a supportive fun group. But it’s just running, yes – No, it’s more. There’s fantastic food to fuel your running, down time by the pool or beach to re-charge and fantastic scenery but most of all it’s fun. This was my third time and it won’t be my last. My first Embrace trip this october. A beautiful location, with lots of chances to get out and see the area. Sessions are very well planned so that any ability can get some benefit from them, and I left with lots more training ideas. After going through a bit of a rut, I feel more enthused and enthuastic about the sport. The coaches are super organised, and flexible, with lots of good tips and suggestions about how to make the most of training. This was my 2nd Embrace holiday and was just as good second time around. The schedule is tough, but possible. The runs are scenic and fun, and the food, beer and wine really finish it off to be a great holiday. I’m very happy to have come away from the holiday achieving all of the little targets I set myself, including a new 10K PB on the final targeted run. Also, we got to do an afternoon Sea Kayaking in the grottos around Lagos, which was fantastic fun. This was my fourth and definitely not my last Embrace holiday. Everything about these weeks is brilliant; accommodation, location, food and most importantly the coaching and running sessions. The sessions are varied and extremely well organised, the sense of achieving so much by the end of the week is great. Sharing all this with Embrace friends old and new of all abilities tops it all off. Had a blast with like-minded people and trainers. We have hard work and fun on the semi-officially named ‘Party Camp’ that rewarded working hard and playing hard. A real privilege to be a part of! I love it there, so much so that within 36 hours of being back in the UK I had already booked to come back. Training and food is top notch. I have been to Embrace four times and love it. I have made some amazing friend’s who are just as mad as me. The food is amazing and the apartments are spacious and clean. The coaches support all abilities and there is never too much pressure. I plan one only every October lol.. well until my body allows that is. Come on what are you waiting for. This was my 4th Embrace holiday and by far not the last! Brilliant atmosphere, delicious food and the accomodation is top class. This time I was training for Venice marathon – where a group of Embracers met up for the weekend (photo below). I’m a really slow runner but that’s not a worry, everyone is really gread and supportive, the encouragement is amazing. In between the runs you have all the time to relax by the pool, go to the beach, enjoy your friends company – the best kind of holiday! I’ll be back again in 2016 and I’ve also taken the plunge and signed up for an Ironman camp in the Alps in June – without Embrace I probably never would have dared! Lovely weather in a beautiful place – very good homemade food and hard working with good people 🙂 Difficult to expect better in one week!!! Every runner should try a camp with Embrace! If you want to have some serious training with a huge smile on your face, then this is the time & the place to do it. The Embrace team are amongst the friendliest people that you can hope to meet, they’ll look after you, coach you, encourage you, feed you great food, beer & wine and at the end of the week, you’ll be a better, happier runner for it. And on top of that; you’ll make friends for life with your other runners. This was my 6th Embrace camp and my 5th in the Algarve. So what can I say that I’ve not said before? Everything is there to make sure your training is optimised – great food, great location, great run settings and excellent coaching and advice with time to relax between hard sessions. You even get to enjoy the sea and sun, have fun, make loads of friends with the same interests and even “party”. 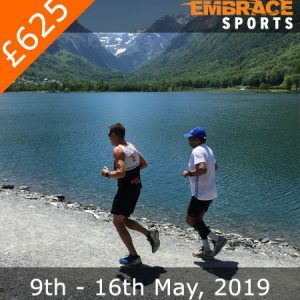 So if you’re thinking of coming on a running or triathlon holiday – choose Embrace. I get loads out of it every time and I’ll be back for more next year!!! My second camp and I will undoubtedly be back! Great variety of training and abilities. Plenty of down time to recover and spending time with likeminded people is best of all. A great setting, really friendly people, wonderful food and running in the sun. This was my first Embrace holiday, but hopefully not my last. My first time at a embrace camp but won’t be my last . Had a great weeks training and made some great friends, Neil and the team were fantastic hosts and the training was varied to cover different sessions and for all abilities. Food was fantastic and plentiful. If you love running then this is a must. A great week as always and so much fun! Gave me the kick start I needed to put more focus on my running! Always amazed at the level of commitment from the coaches and the customers – an inspiring week! 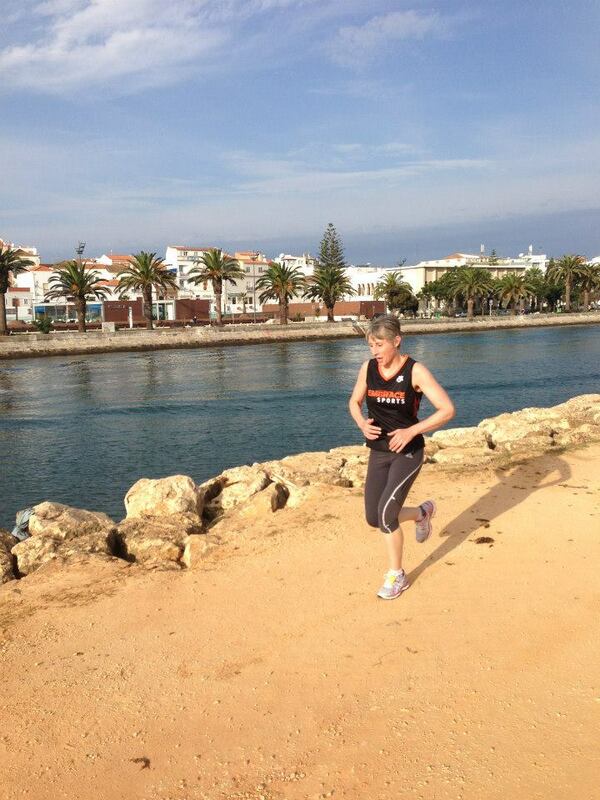 I loved my first (but not last) Embrace holiday – great people, great variety of running sessions and great food. Can’t wait to go back! This was my first holiday with Embrace Sports. I really enjoyed the trip. The detailed training plan and variety of running routes challenged me and encouraged me to push beyond my limits. I would highly recommend the trip! This was my first Embarace holiday, and I really enjoyed it. Run much more than I would ver do at home, and was really challenged to do so. The support and encouragement from others was fantastic. I was concerned I would be too old and too slow but I wasn’t at all. Also , the food and accommodation were both great. The was my 6th Embrace holiday and I always come back planning the next one. For anyone on the fence about booking – just go for it! It’s a perfect balance of training and downtime, suits all abilities and a great way to make likeminded friends for life! This was my third Portugal Running Holiday and each year it just get’s better. The small group (around 36 which includes the coaches) is perfect. You get to meet old friends as well as making loads of new ones too. Each session is structured well throughout the week and I always come back home feeling stronger, fitter and faster than ever. You get to run in some of the most beautiful (if not challenging) parts of the Algarve and the views are simply breathtaking. At the end of the week I just want to stay longer, that’s how good this holiday is. Cheers. This was my third Embrace running holiday and was as fantastic as ever. Neil, Graeme and the team are all really welcoming and friendly and it really is incredible how much running you can pack in to a week! The programme is expertly designed, with the perfect mix of hard sessions and recovery. It really helps to be able to relax in the sun by the pool or head to the lovely beaches in the afternoons and to have wonderful food in the evenings (plus the odd therapeutic glass of wine / beer!). I am not a fast runner and, with other commitments, rarely get to run more than 15-20 miles in a normal week at home, but the sessions are all brilliantly tailored to allow even the non-serious runners like me to enjoy ourselves and benefit from the great coaching, while never feeling too slow or excluded. There is also a wonderful social aspect to these holidays so that I have found that it is the perfect solution to holidaying by myself – being guaranteed to have a laugh with like-minded people and make great friends! I loved everything about this holiday! The training plan was fantastic and the coaches were really supportive. The schedule looks daunting but once you are there the environment really allows you to exceed expectations. The best part of the trip was all of the other runners on the holiday! This was my first trip with Embrace and I loved it! The accommodation was great, the food was amazing and the Embrace team were really welcoming and supportive.